The full-sized Nissan Armada SUV was introduced in 2004. It is powered by a 305 horsepower V8 engine and a 5 speed automatic transmission with a choice for four-wheel drive or rear-wheel drive. The 3 models of Armada include the SE, SE Off-road and the LE. Armada has a seating capacity for up to eight passengers and the second and third row seats can fold flush with the floor. The LE's had a removable center console between its second row bucket seats. All three models come standard with curtain side airbags covering all three rows. Leather upholstery and front side airbags are optional on SE models. Load-leveling suspension is a standard feature in the LE model, but optional for the others. Other standard features in the LE include rear obstacle detection, heated mirrors, and power-adjustable pedals. DVD entertainment and navigation systems are optional features in all three models. The SE off-road model consists of features like special shock absorbers, skid plates and 17" wheels. 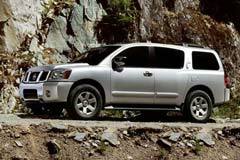 New changes were introduced in the 2011 Nissan Armada models. The SE and SE Off-Road models were dropped and replaced with SV and SL models. Used Nissan Armada's are the best bet for customers who are looking for fuel efficient cars with room for passengers and cargo.